A wide offering of X Games Aspen 2013 content will be simultaneously distributed across multiple broadcast and digital platforms January 24-27 live from Buttermilk Mountain in Aspen. X Games content will be available via television, smartphones, tablets and online through digital and social network platforms. By enhancing and adding dimension to the X Games viewing experience, fans will have the opportunity to watch all the action, get an inside look at the event, and establish a two-way conversation with ESPN, athletes and other viewers. X Games Aspen 2013 will feature the return of live coverage on ABC, as well as 20 hours of live X Games Aspen content in high-definition on ESPN, January 24 – 27, 2013 from Aspen, Colo. WatchESPN will stream all 20 hours of coverage as well as three hours of original content and ESPN 3D will telecast all 21.5 hours of live X Games coverage. New host, Ramona Bruland, will host all 20 hours of the X Games coverage on ESPN and ABC. With more than 10 years of experience in the television industry and two Heartland Emmy nominations, Ramona has been seen on TV screens across Australia, Europe and the USA covering action sports, lifestyle, arts and culture, luxury and travel on multiple networks. *For the full telecast schedule please check your local listings, or visit www.xgames.com for fans and www.espnmediazone.com for media members. In addition to all of the content on ESPN’s U.S.-based media platforms, X Games Aspen will be televised in 184 countries and territories to more than 430.6 million homes, including live coverage in Africa, Brazil, Canada, Central America, Europe, Middle East and South America. 21.5 live hours of the event will also be simulcast on ESPN’s international broadband platforms in 16 countries across Australia, Europe and Latin America. ESPN will produce 10 one-hour syndication shows for networks to air following the event. XGames.com – The newly redesigned XGames.com will provide comprehensive onsite coverage from Aspen including an all new, enhanced second screen experience, X Cast. With live results, near-real-time “leader board” video of competition runs, game-cast elements like TrickTrack (which graphically captures trick data in real time) and Hypemeter (a worldwide applause meter that measures, scores and displays the collective excitement around X Games at any time), X Cast in 2013 will be the most interactive second screen web experience X Games has seen to date. Additionally, the new site will feature personalized and “Pop-Up”-style video (around daily and event highlights, medal runs and features) and the Scene, the all-new lifestyle section of XGames.com, covering the films, music and style elements happening on the ground in Aspen. ESPN.com’s Wayne Drehs will also be onsite writing enterprise features around marquee events and athletes of the event, and full-bleed photo galleries will be shot by the best creative talent in the action sports industry. The new and improved X Games app – The app, which it compatible with iPhone, iPad and Android, puts the world’s premier action sports event right at your fingertips, making it easier than ever to watch highlights, view schedules, track scores and keep up with the top names and hottest news coming out of Aspen. Use the app while watching the TV broadcast to take full advantage of TrickTrack, then fire up the interactive HypeMeter and virtually “cheer” for your favorite moments using your device and quick hands. With streaming music content and deep links to every live competition on WatchESPN, this free app is a must-have for X Games fans everywhere. XGames.com/realsnow – Eight invited snowboarders will submit a one-minute video with a maximum of eight tricks to be judged by a committee of well-respected snowboarding industry professionals. A first place prize of $50,000 will be awarded to the winner, as well as gold, silver and bronze medals for the top 3 finishers. Fans will also have a chance to view and vote on their favorite video in a tournament-style bracket with the fan favorite winning $10,000. Visit XGames.com/realsnow to view videos and vote for your favorite athlete. Inside X – As increasing numbers of fans now watch live sporting events on television, while concurrently connected to the internet, Inside X will offer viewers a look at everything happening on and off-site during X Games Aspen. Through on-demand clips, Inside X will feature a variety of event highlights and expert analysis, behind-the-scenes access, athlete and fan interviews, and an inside look at X Games Music, Film and Style cultural elements from Aspen, Colorado. Inside X will be available in the scene section of Xgames.com, Xgames.com/Scene, throughout the duration of the event. Live Music Webcasts – X Games Music Presents will feature a variety of on-site and off-site concerts throughout X Games Aspen featuring two live webcasts from the X Fest Stage on Buttermilk Mountain. Calvin Harris and Major Lazer will be performing on Saturday and Sunday, 4:30 p.m. – 5:30 p.m. MT and 4:15 p.m. – 5:15 p.m. MT, respectively. The live music webcast will be distributed on XGames.com, the X Game Facebook page, and the X Games Livestream Channel. 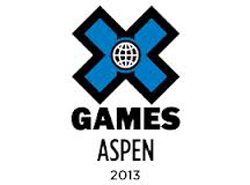 ESPN3 – ESPN3 will stream three hours of exclusive live coverage from X Games Aspen 2013. WatchESPN – Fans will also be able to watch live coverage of every event on ESPN through their computers, smartphones or tablets via WatchESPN. WatchESPN delivers live access to ESPN, ESPN2, ESPNU, ESPN3 and ESPN Buzzer Beater/Goal Line on PCs, smartphones and tablets to fans who receive ESPN’s linear networks as part of their video subscription from Time Warner Cable, Bright House Networks, Verizon FiOS TV or Comcast Xfinity TV. ESPN MobileTV – will provide 18 hours of live event coverage. Daily highlights and discipline highlights will be offered On Demand. The X Games Aspen telecast will feature music from Calvin Harris, Major Lazer and Green Day and many more. iTunes will be promoting a splash page available at www.itunes.com/xgames for everything X Games past and present. The splash page will feature video content, podcasts, apps, films and music. Sony, Microsoft, and Amazon will also have all daily highlights and discipline highlights from X Games Aspen available for purchase.